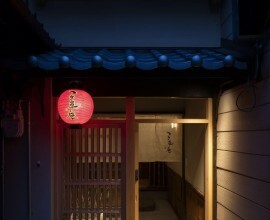  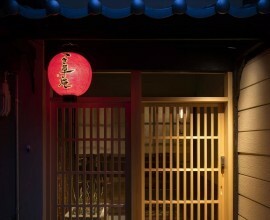 "Tsukikusa-an" is located in Miyagawa-cho, right next to the famous and historical Gion. 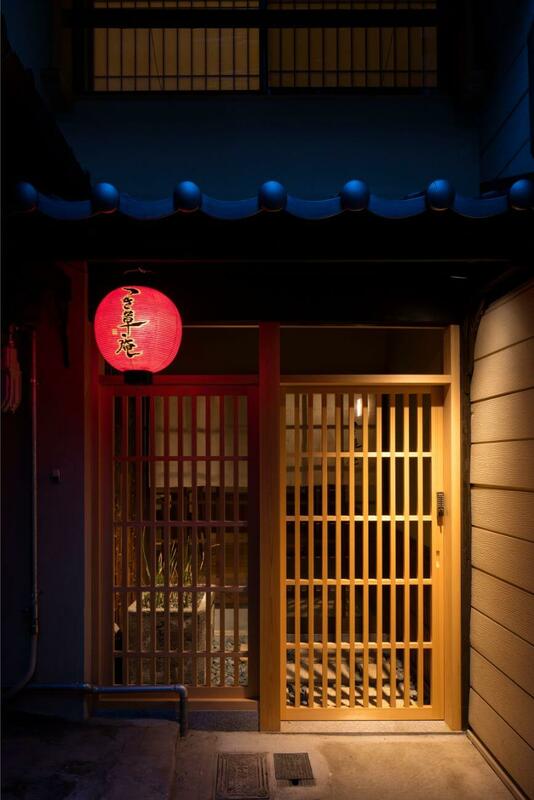 Both Miyagawa-cho and Gion are two of five famous Hanamachi districts (flower districts) of Kyoto. 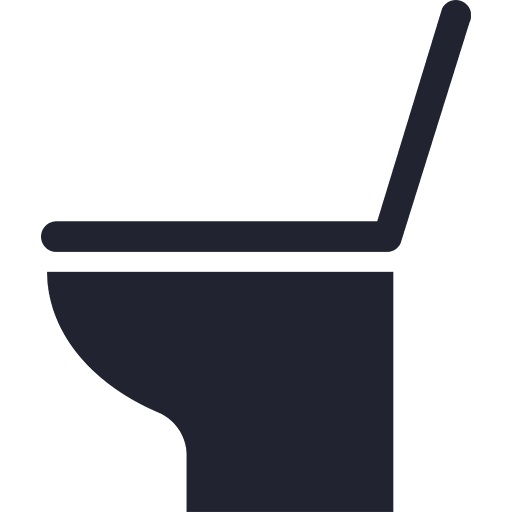 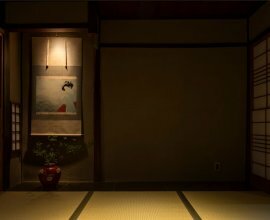 Many geisha, or geiko, have spent their youths in these hanamachi districts practicing and perfecting their skills in Japan’s traditional and high-class form of entertainment – singing, dancing, musical instruments, and more. 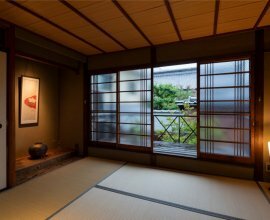 You can find subtle reminders of this colourful past throughout the house. 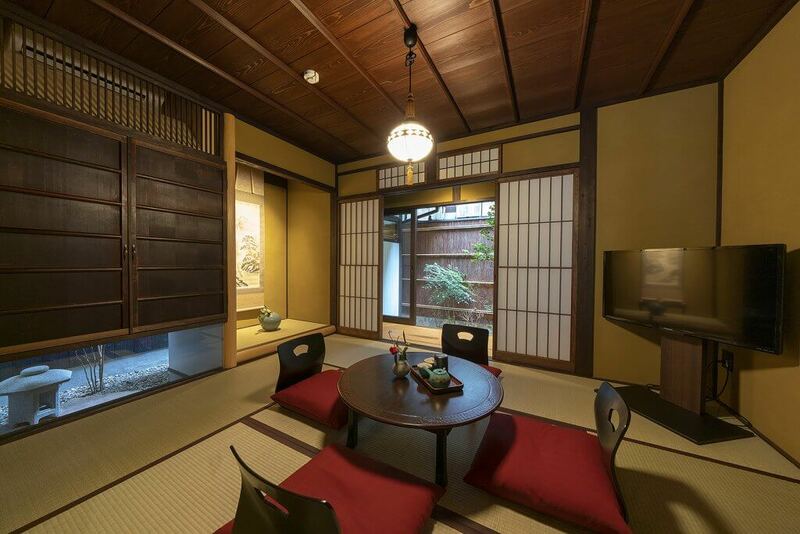 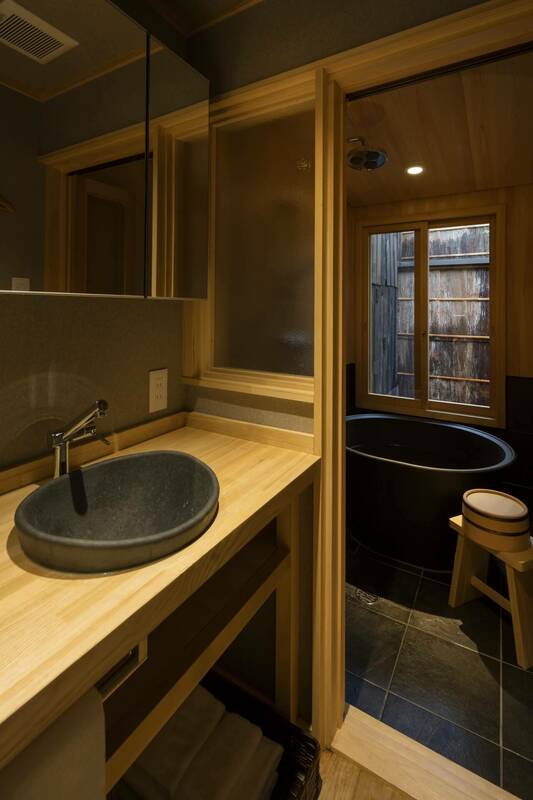 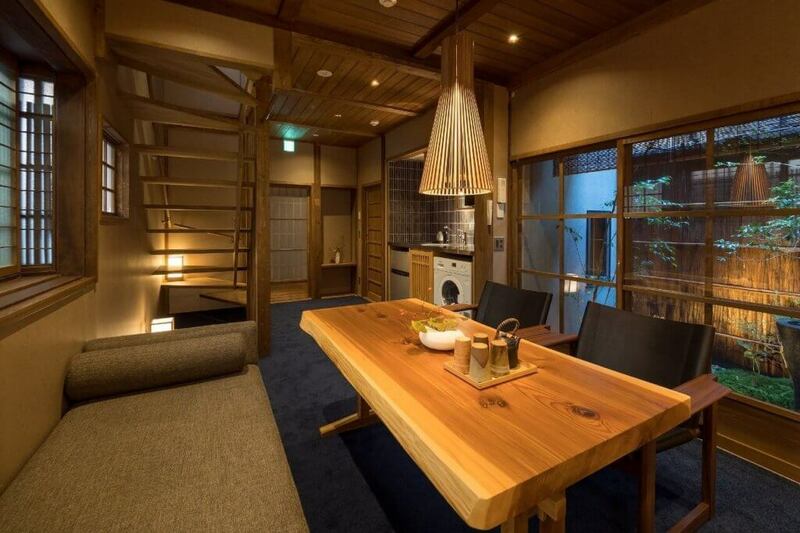 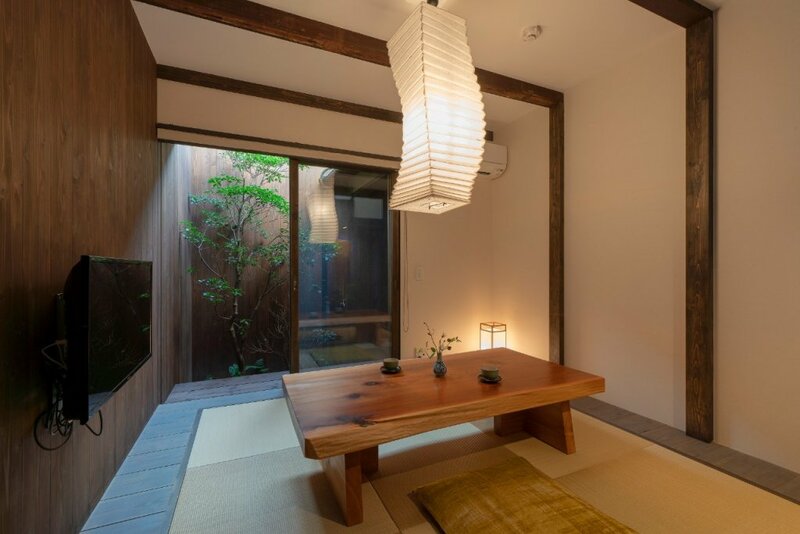 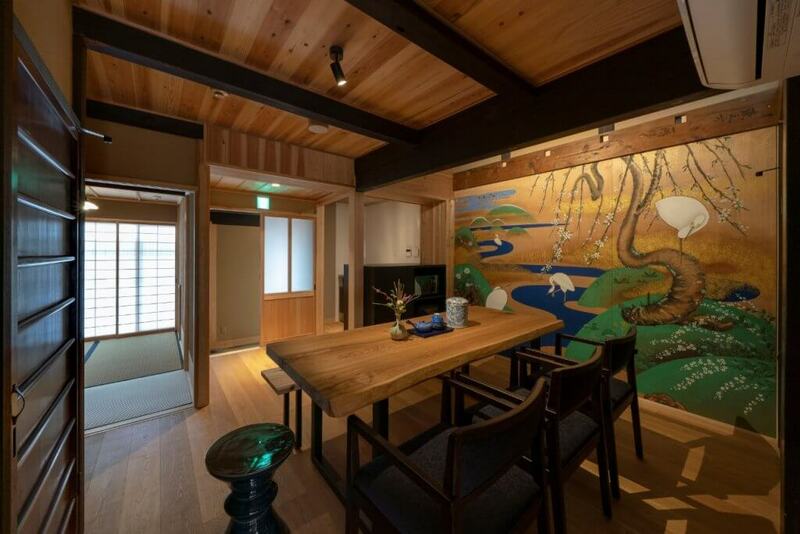 Despite this property being located in the middle of one of Kyoto’s most popular and exciting areas, take one step inside this Machiya and find yourself a world away from the busy city life. 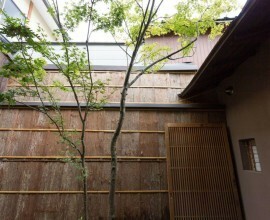 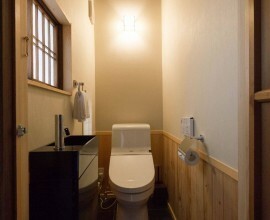 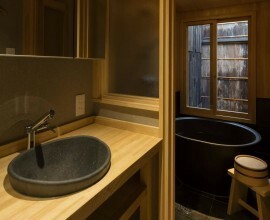 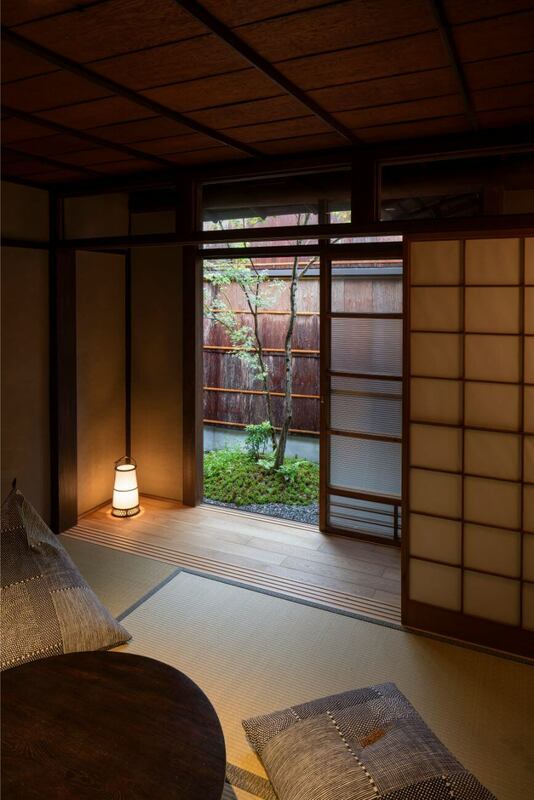 Quiet retreat near Gion Relax in tranquility in this machiya located 7-minutes away from Gion geiko district. 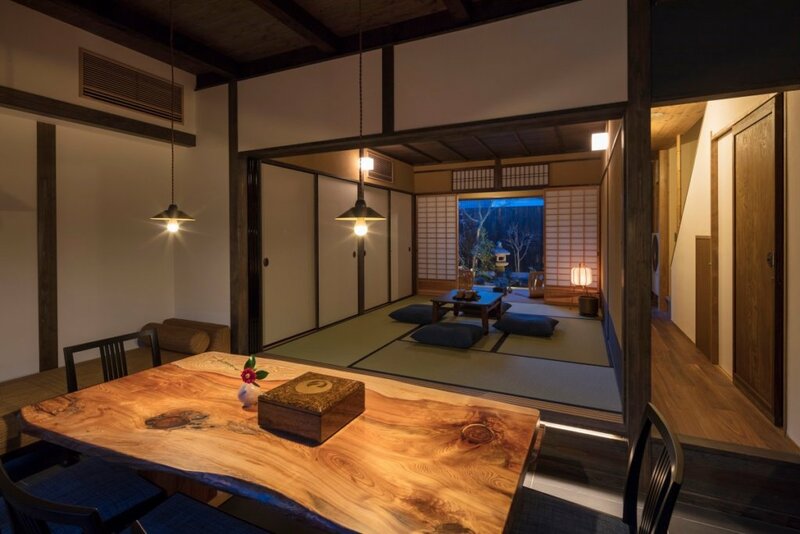 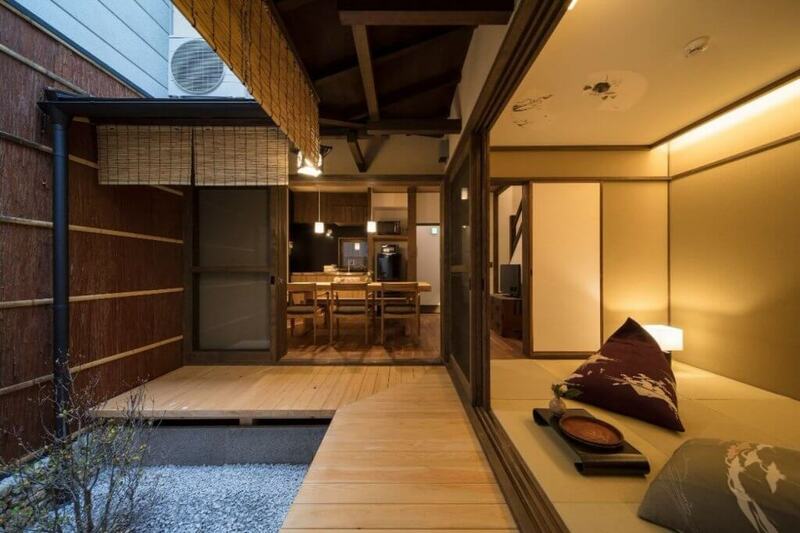 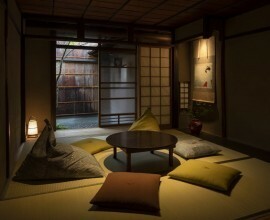 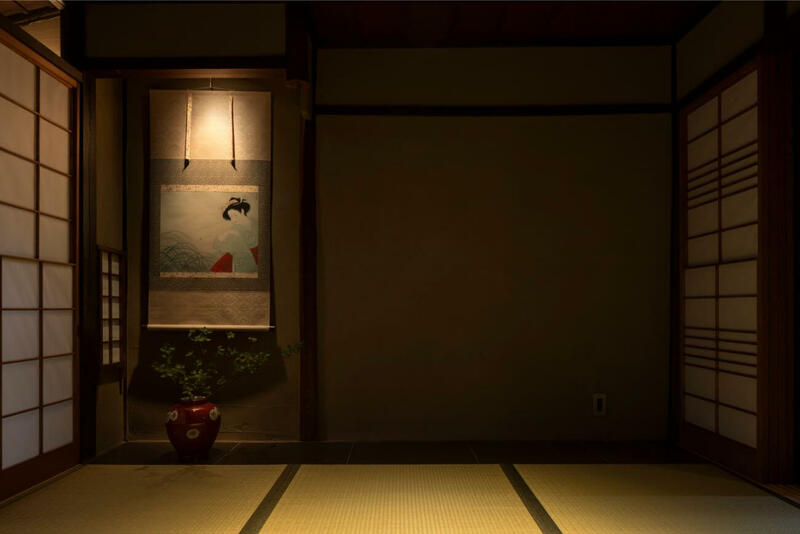 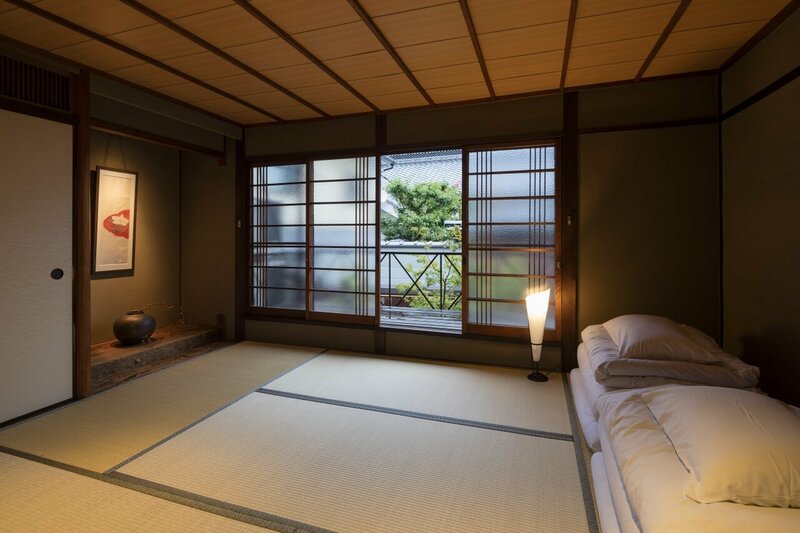 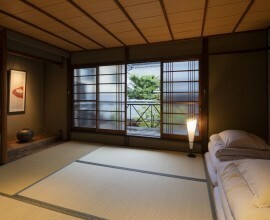 Look out onto the garden as you experience life in traditional Kyoto in this Japanese living room. 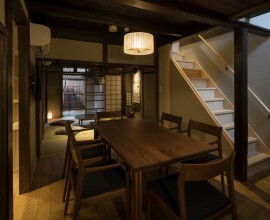 Spacious dining room Enjoy a meal at the large dining table with 6 chairs. 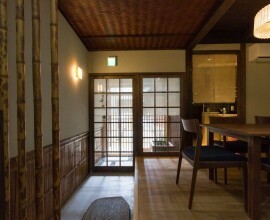 Relive the day’s adventures as you appreciate such traditional design details as the woven wooden ceiling and bamboo. 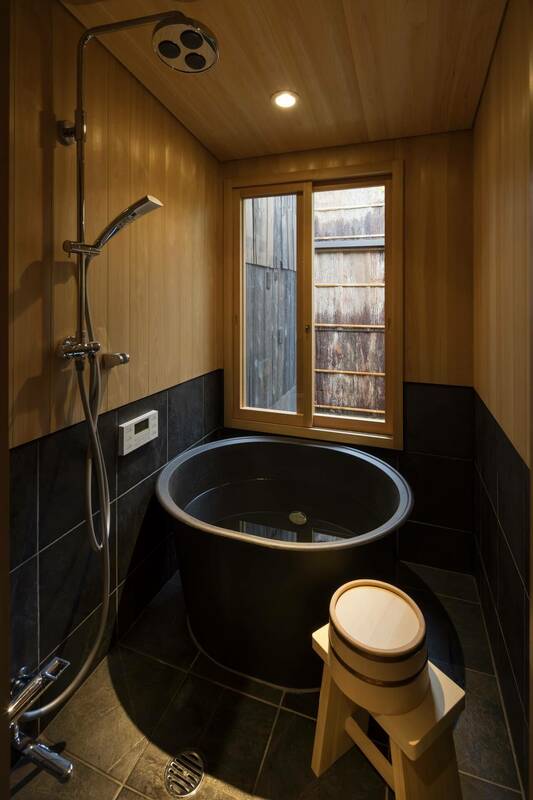 Unwind in the bathroom Look out into the Japanese garden as you soak in the deep “goemon-buro” bathtub or refresh under the rainfall shower. 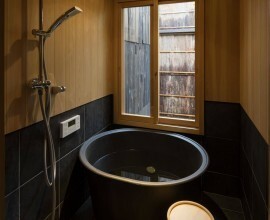 Pamper yourself using our custom bath amenities in fresh, relaxing scents. 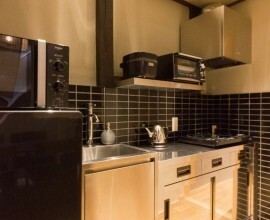 Kitchen Prepare your favourite light meal or breakfast in the furnished kitchen. 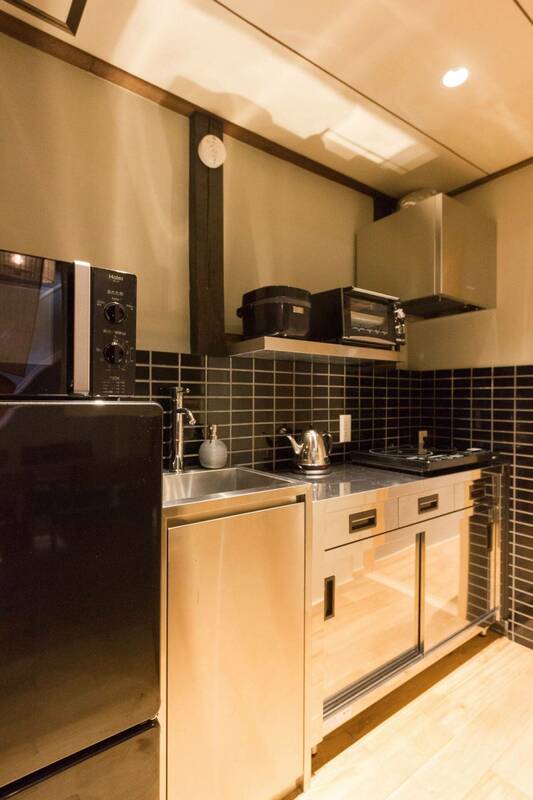 The sleek worktop adds a contemporary feel to the house. 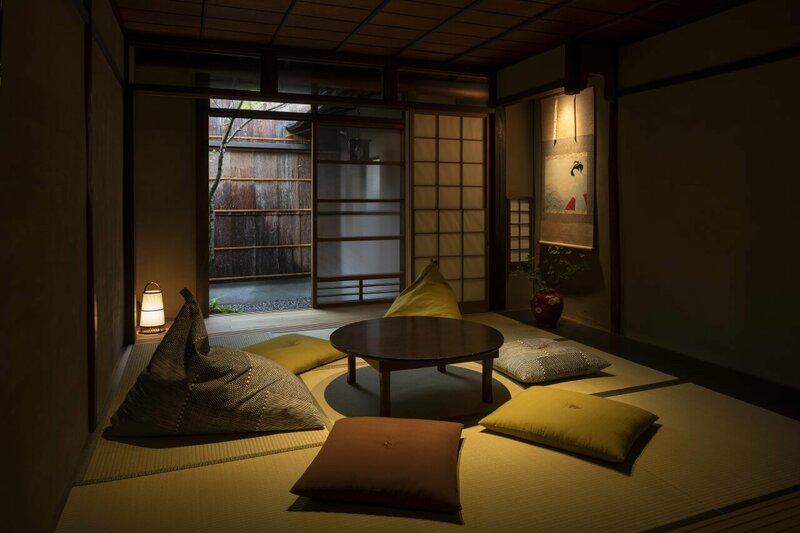 Savour a cup of our original MACHIYA coffee. 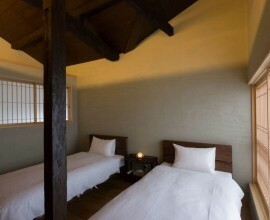 Western-style bedroom High, slanted ceilings and a large window covered by shoji paper blinds create an airy and calm space. 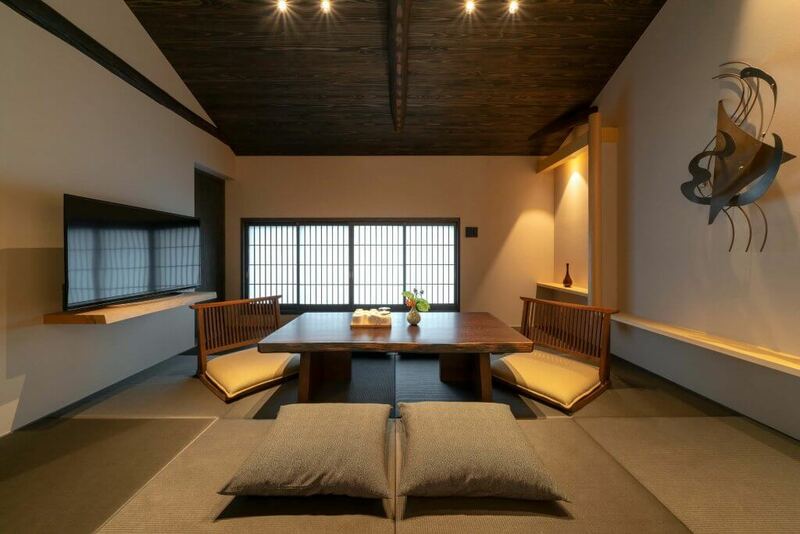 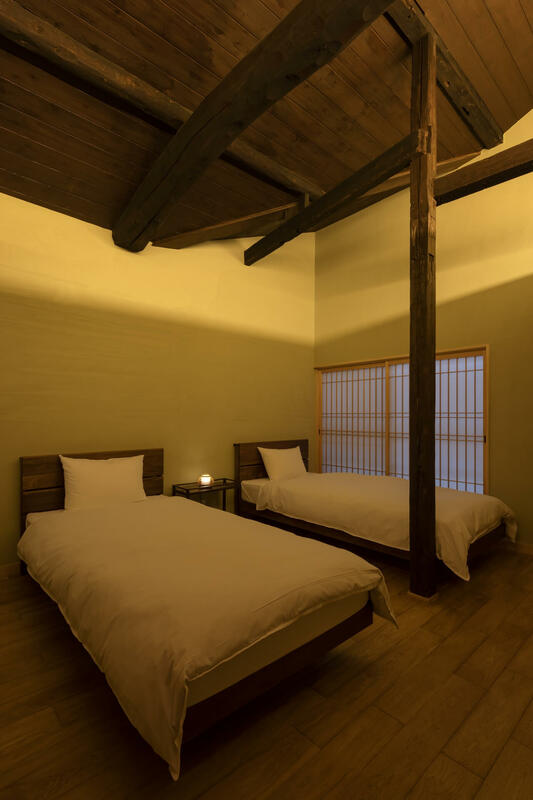 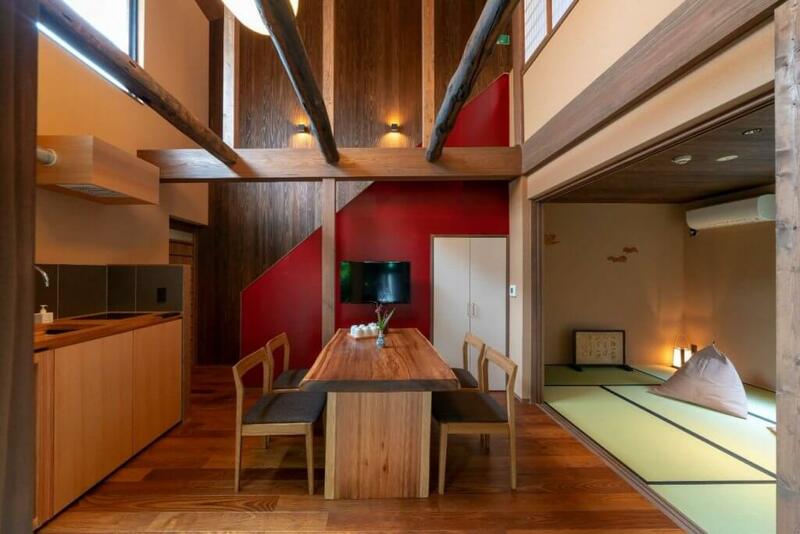 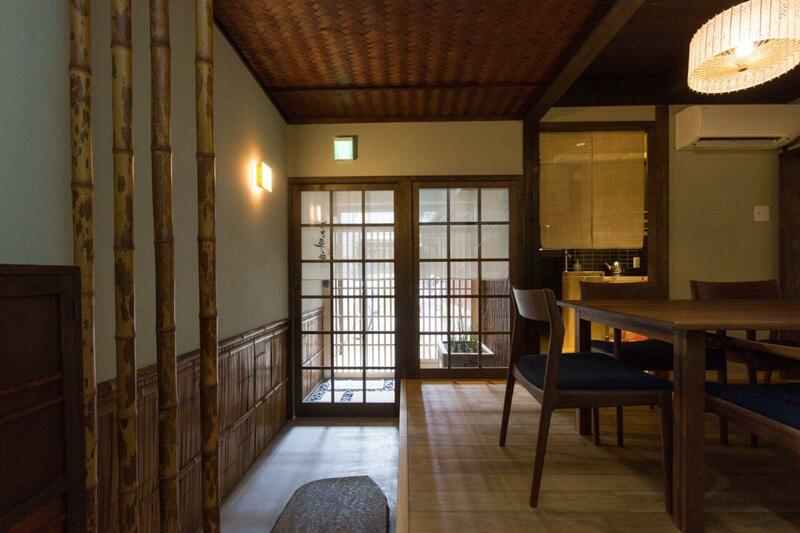 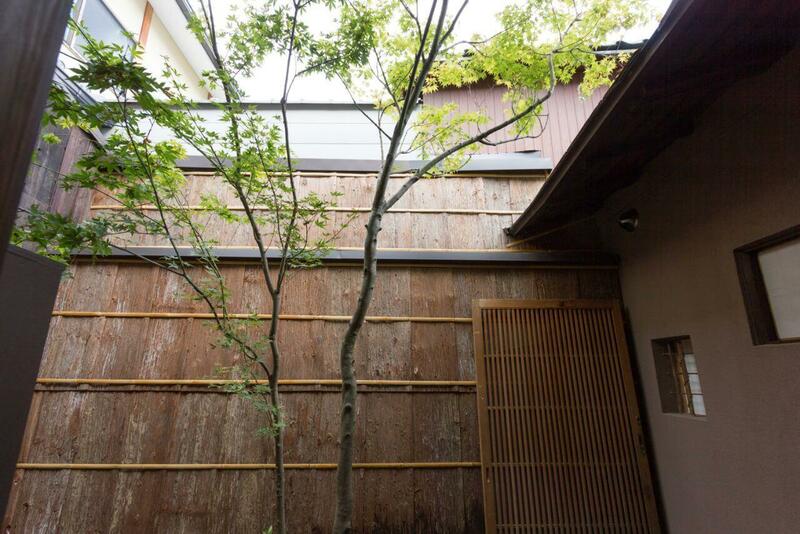 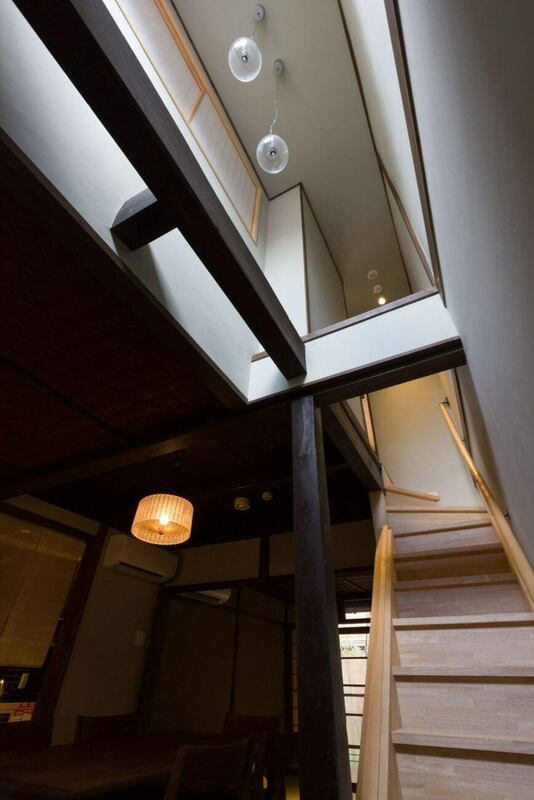 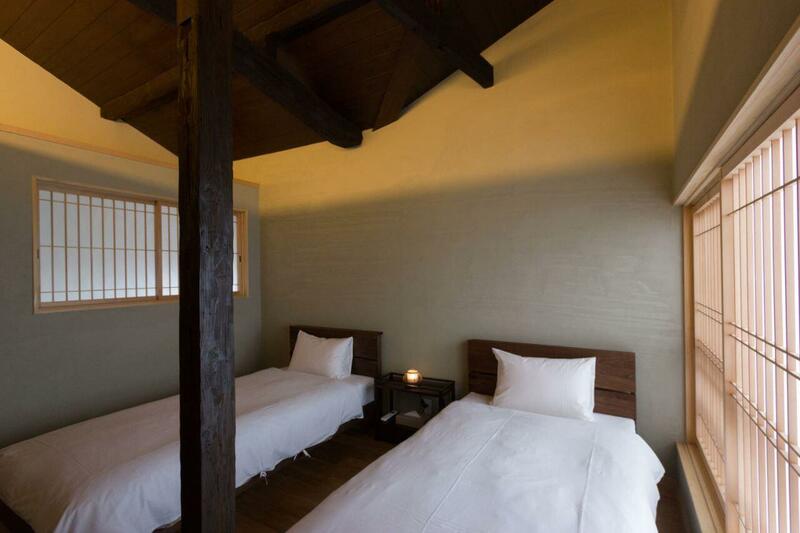 Exposed wooden beams allows you to appreciate the original architecture of “Tsukikusa-an”. 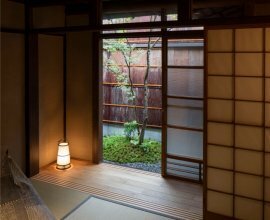 Japanese-style bedroom With the wooden ceiling, tatami flooring and ‘tsukonoma’ art alcove, take in traditional atmosphere of this room. 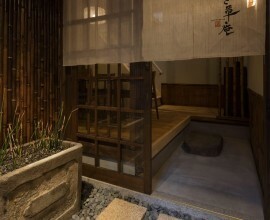 Feel refreshed by the natural light in the morning, and retreat here later in the evening. 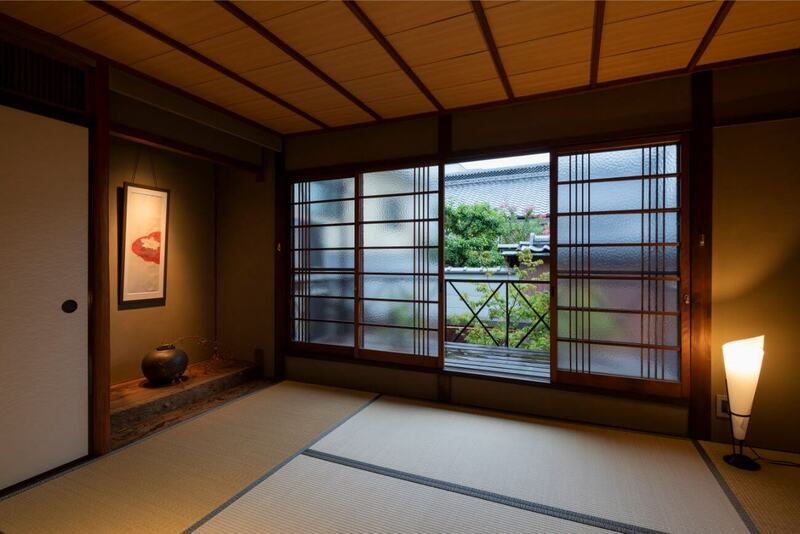 This particular kyo-machiya is owned by a former geiko who worked at one of the many traditional teahouses found in Kyoto’s hanamachi districts. 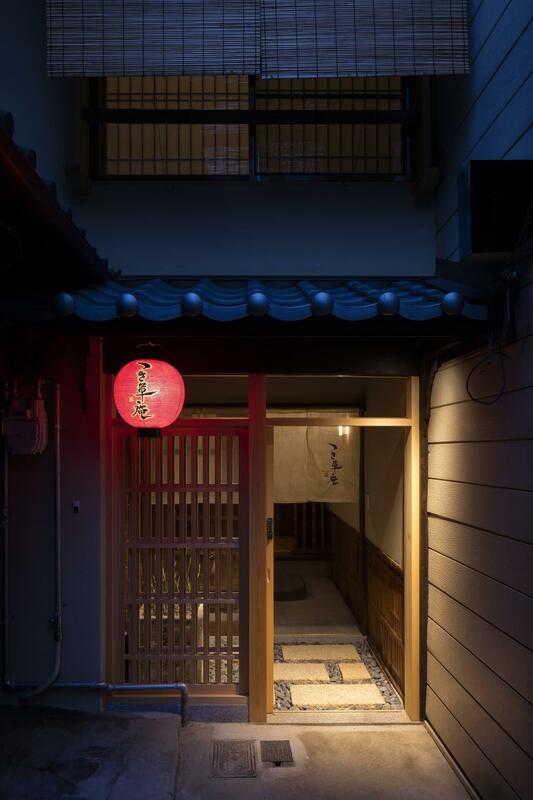 Find yourself a world away whilst walking amongst the stone-cobbled streets and traditional Japanese architecture. From home, walk towards the Kamo River and find yourself at Shijo-Kawaramachi – Kyoto City’s exciting shopping, dining, and nightlife area. 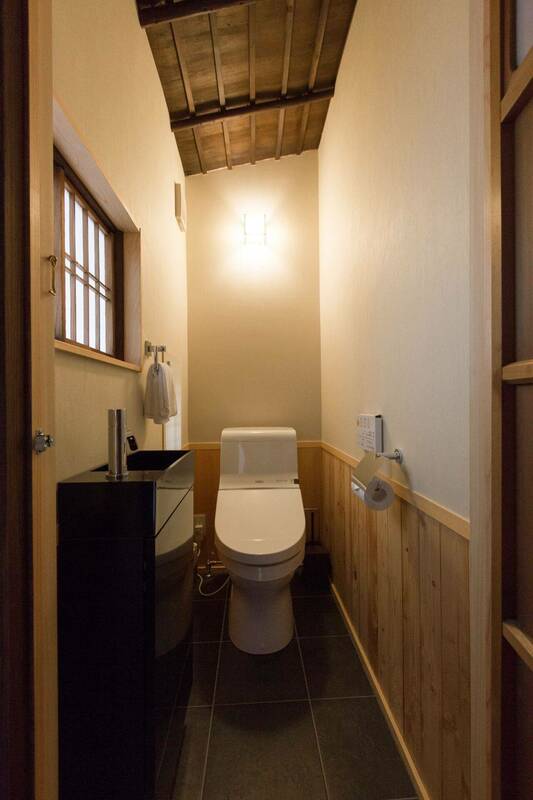 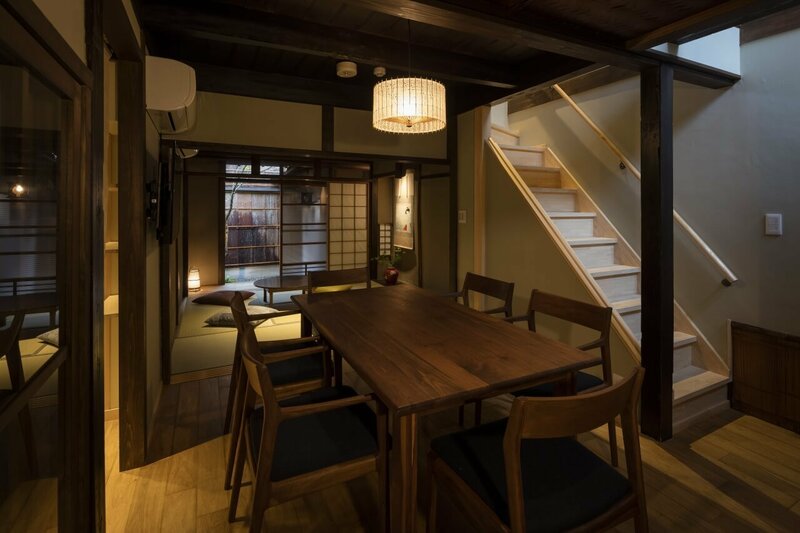 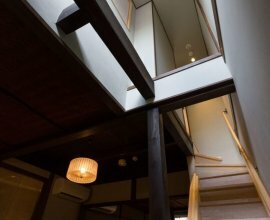 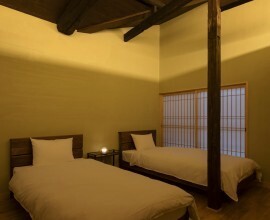 Surrounging this machiya house, you'll find restaurants serving traditional and modern Kyoto cuisine, Kyoto’s most long-established shops, and the city’s best sightseeing attractions. 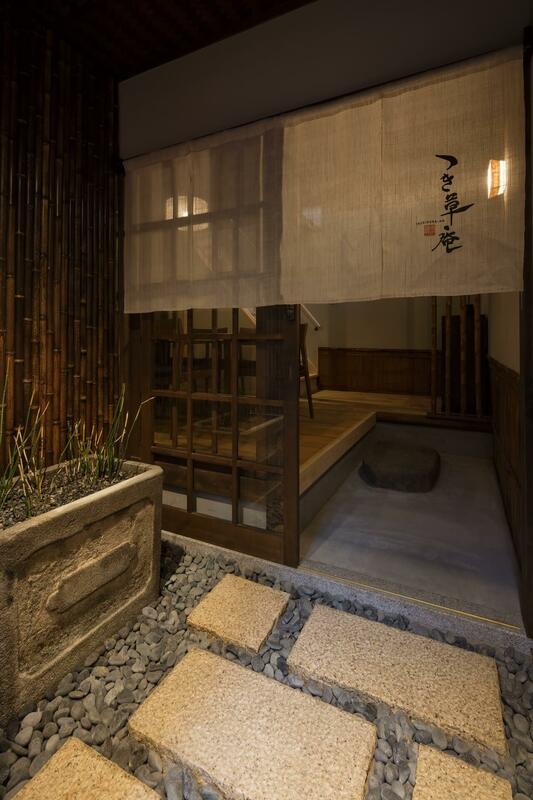 Find yourself a world away whilst walking amongst the stone-cobbled streets and traditional Japanese architecture.